Mapo Tofu is also seen spelled as Mabo Tofu with a b. It is also known as Grandmother’s Pockmarked Bean Curd. This post contains affiliate links. Please read the disclosures for further details. Mapo tofu is a classic Sichuan Chinese favorite made with fermented chili bean paste, soft tofu, and ground pork. This vegan version is just as tasty without the animal fat. The flavors in this dish are very similar to those used in “Fish” Fragrant Fairytale Eggplant, another vegan recipe. 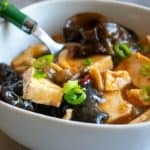 To get a vegan mapo tofu with as much savory flavor without using the traditional ground pork or more than 10 ingredients. Though a clove of garlic made it into the picture, it did not make it into the final 10 ingredient list. Garlic is generally nice to have in everything, but ginger is the more commonly used Chinese ingredient. Also, we got some of the earthiness from garlic by caramelizing mushrooms instead. You must have these two ingredients to make this dish. Everything else is just for additional flavor, but the heart of the dish is comprised of those two items. This may not be found at your regular grocery store, but it is available online and at Chinese grocery stores. It is made of broad beans and/or soybeans that are salted and fermented, sometimes with chili and sometimes without. The amount of chili is usually enough not to warrant the addition of any other fresh or dried chile. Known as doubanjiang, it has a characteristic saltiness, vinegariness, and rich, fermented flavor that is difficult to substitute. Its thick sauce consistency adds savoriness and umami while still being vegan. Some versions add wheat flour and others may be gluten-free. This sauce is used in so many Sichuan Chinese dishes liberally, just like soy sauce. It is easy to use up the whole jar if you enjoy that characteristic fermented chili flavor. Tofu comes in many forms. Soft tofu, also known as silken tofu, has varying degrees of softness. 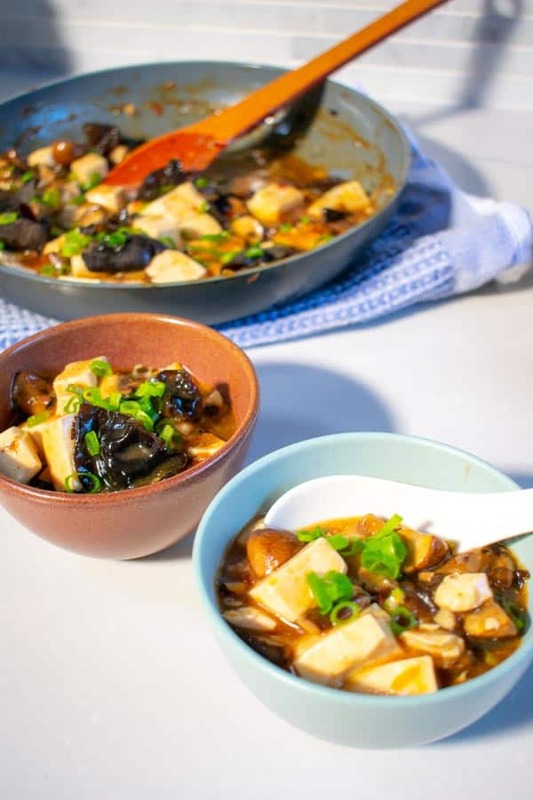 In China, the soft tofu used for this dish is soft and silky while still holding its shape after being cut into cubes. Across the Atlantic, soft tofu you buy at in the US can range from holding its shape after cutting to dissolving into messy, small curds. Experimentation with brands is best. If you prefer not to chance it, medium or medium firm tofu will work well too. The soft tofu just has a melt in your mouth texture that slips gently down your throat with the silky sauce. You may be tempted to buy the packaged box that has the seasoning mix for mapo tofu all made up for you. However, it also has MSG and a number of other unpronounceable ingredients. 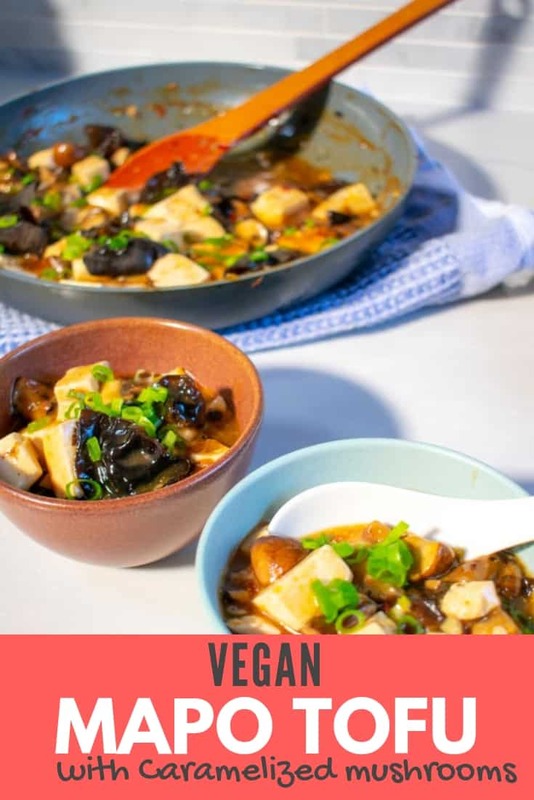 This vegan recipe may not have quite the same amount of fullness, saltiness, and mouthfeel you get from MSG, but it is all natural and just as quick and easy to make. A mix of quartered crimini mushrooms and destemmed shitake mushrooms are used in this pan. The stem of the shitake mushroom is too tough to eat so must be removed. 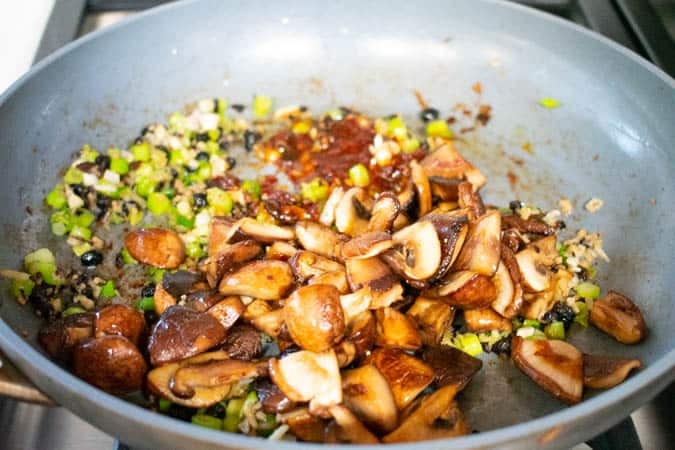 Spread the chopped mushrooms in a single layer with a drizzle of oil. Leave on medium heat for a few minutes without stirring to allow the bottom to brown. Stir after a few minutes to caramelize the other side of the mushrooms. 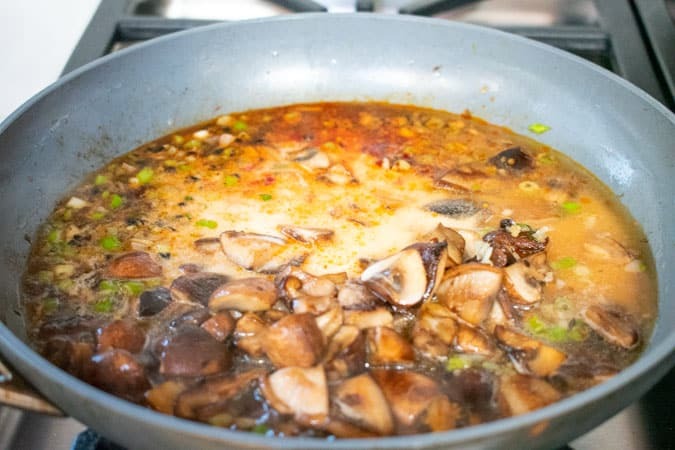 Do not add salt, since that will draw water out of the mushrooms and keep them from browning. This will take 5-7 minutes depending on how hot your pan is. The little black flecks in the picture are Chinese salted black beans, a classic ingredient for this dish but optional add above the 10 ingredients listed in the recipe. 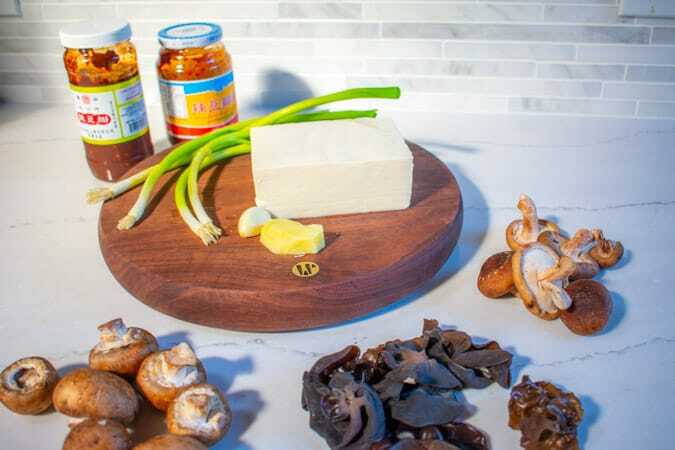 Once the mushrooms are caramelized, add the chopped ginger, white part of the green onion, and chili bean paste. Stir and cook for about a minute to bloom the flavors. Mapo tofu requires a thickening agent, so you get that thick sauce consistency. Potato starch gives a silkier texture than cornstarch if you have it. Add the vegetable stock and thickening agent and bring to a bubble. For vegetable stock, you might try low sodium, organic Better than Bouillon vegetable base, since it’s easier to have sitting around for long periods of time, like a fridge condiment. In that case, add 1 Tbsp plus 1 1/2 cups of water. It also has a little bit of tomato in the base, which most other veg stocks to do not. For the thickener, potato starch mixed with water is preferred. Corn starch could also be used, but potato starch results in a silkier, less cloudy sauce. For the thickner to work, the liquid must come to a boil. Keep stirring, so the starch is distributed and does not clump. Fresh woodear mushrooms are sprinkled over the top. Their fuzzy, crunchy texture is probably most unusual of all mushroom varieties. 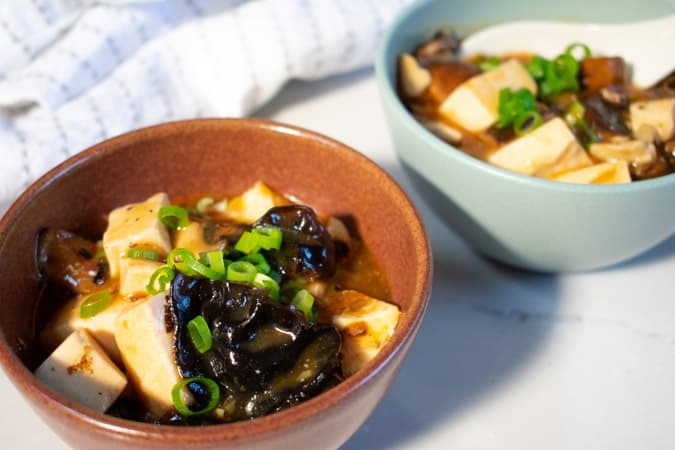 Swirl in the cubed soft tofu and woodear mushrooms if using. Stir occasionally and cook for a few minutes until the tofu is heated through. Fresh woodear mushrooms, if available to you, adds crunch to this otherwise smooth texture of the dish. They also come dried in packages and can be rehydrated, if you would like to try them. The requisite green onion sprinkled over the top, on what seems like every Asian dish. Kind of like parsley in American cuisine. Sprinkle over the chopped green part of the green onion, and serve hot. Eat with rice or without if you are low carb diet. It’s not too salty to require a backdrop of neutral starch. 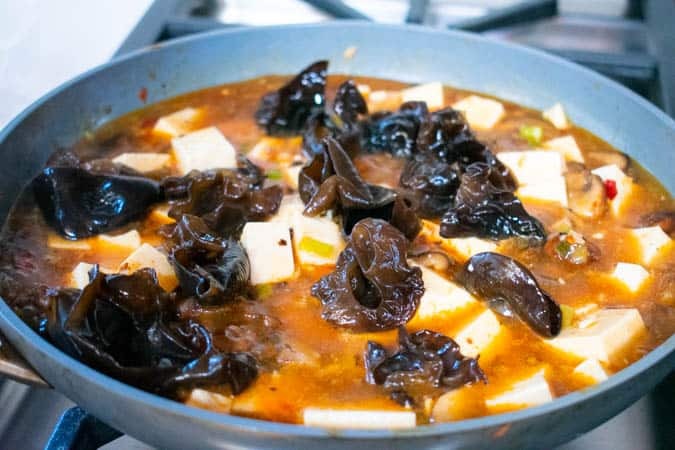 Mapo tofu doesn’t always have to be eaten with rice, especially if you are avoiding carbs. Try spooning into bowls like soup. This dish has many creation stories, but this one comes from Yan-Kit’s Classic Chinese Cookbook by Yan-Kit So. According to So, the dish originates from the late 19th century from the wife of Chef Ch’en Shen-fu in the city of Chengdu. Apparently, she came up with this dish, and the dish is so named because she had pock marks on her face. While “Pock-ma” or “Pock-woman” as a nickname is rather unpleasant, this dish is now nearly a national treasure and tastes quite the contrary. Keep for a few days and reheat. Don’t freeze leftovers. Freezing changes the texture of the tofu to spongy. Heat 1 Tb of oil over medium heat. Add mushrooms (except woodear if using). Toss occasionally. 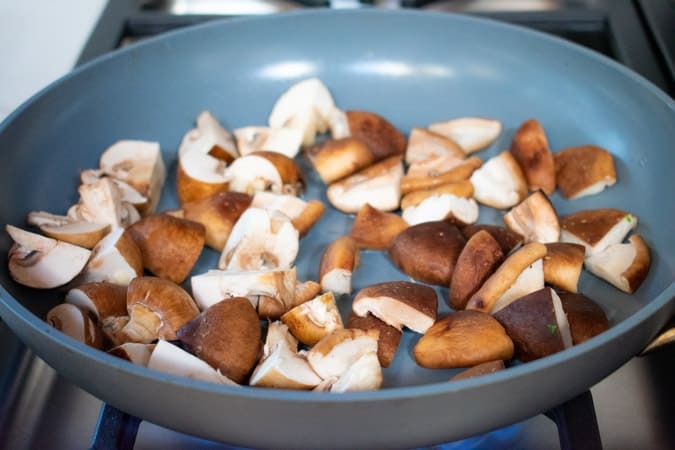 Cook for 5-7 minutes until mushrooms are browned. In the same pan, add 1 Tb of remaining oil over medium heat. Add ginger, garlic, fermented black beans, and white part of the green onion. Stir fry for about one minute to bloom flavors. Add the remaining ingredients. 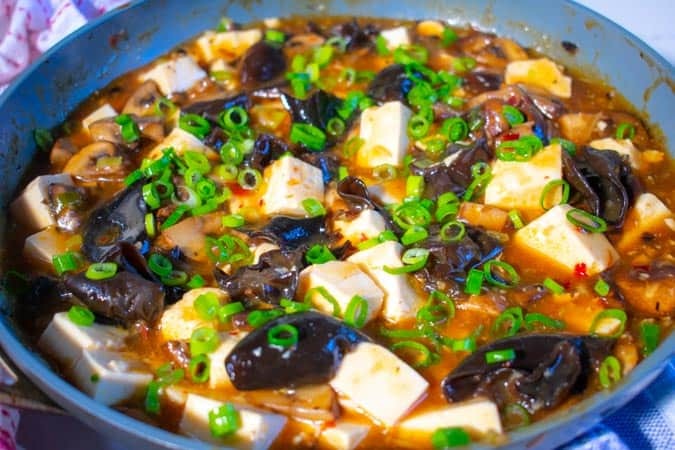 Bring to a simmer while stirring gently so the tofu does not stick to the bottom of the pan. Cook for 3-5 minutes, stirring occasionally until the tofu is heated through. If you don't mind having more than 10 ingredients, you could add the following items. P.S. Do you love vegetarian dishes? Please spread the Asian ♥ and share!